If you’ve ever met me personally, if we’re friends on social media – HELL, if you’ve ever strolled past our home in New Jersey during the month of October, you know ONE thing. But STILL, Halloween is my favorite. That crisp chill in the air, the rustling of freshly fallen leaves at your feet and the smell of a crackling outdoor fire nearby. One of our first dates was carving pumpkins and…yes, going to a Halloween party (we went as Little Red Riding Hood and her furry counterpart). I once threw Tony a surprise Halloween costume party. Even though his birthday is in mid November. 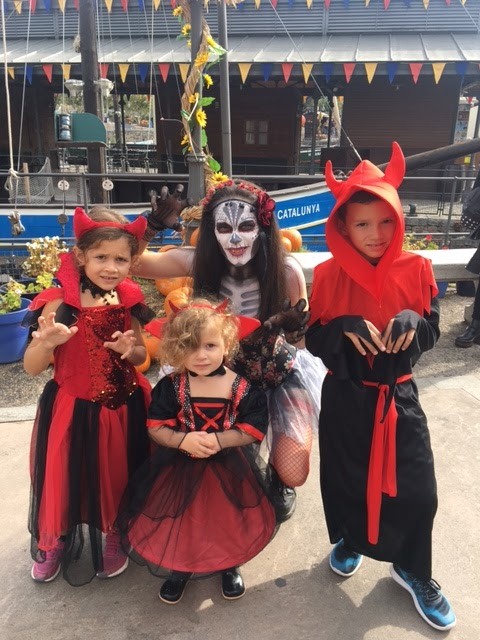 We’ve dressed up along with our children every year since the oldest was old enough to. Hey, gotta do it for the kids right?! Annnnd…I can’t seem to buy enough decorations. 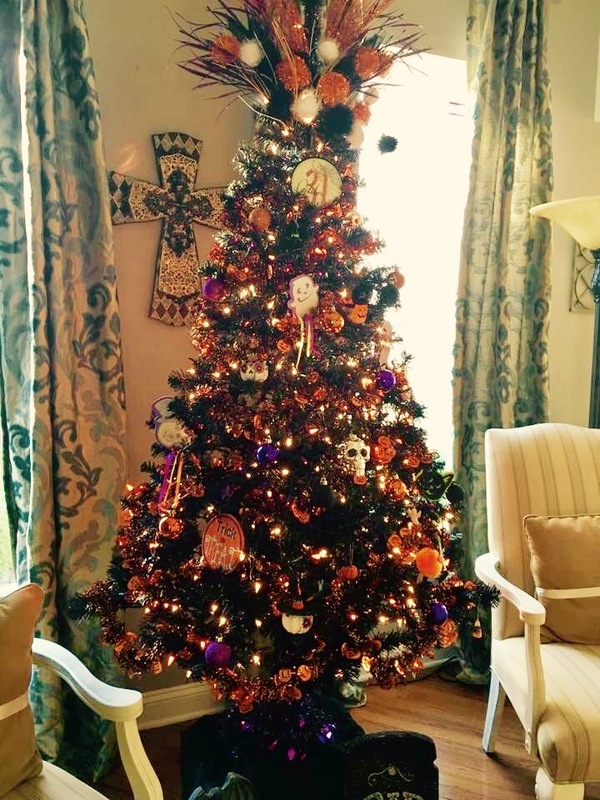 I splurged on a seven-foot tall black Halloween tree a few years ago! I mean…the obsession is real. 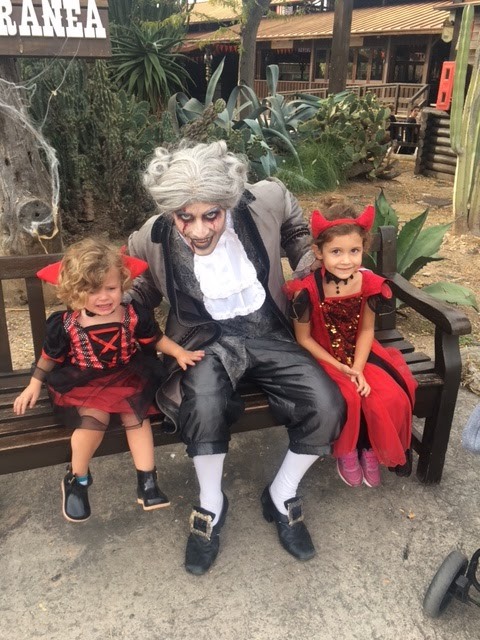 So naturally, when our family decided to relocate our life to Barcelona one year ago, “Halloween in Spain” was one of my very first Google searches (before even researching schools for my kids, I’ll shamefully admit ha!) And to my bewilderment, the city that never sleeps where there is always a buzz and a fiesta….didn’t quite embrace the spookiest night of the year. Really!? My heart sank. BUT it was Spain…not America – and accepting new cultural celebrations is what being an expat is all about. It seemed Dia de los Muertos (Day of the Dead or All Saints’ Day) is the more popular. Still, I was determined to keep alive the family traditions of our favorite holiday. And maybe even welcome some new ones in the process. I had a lot to learn. 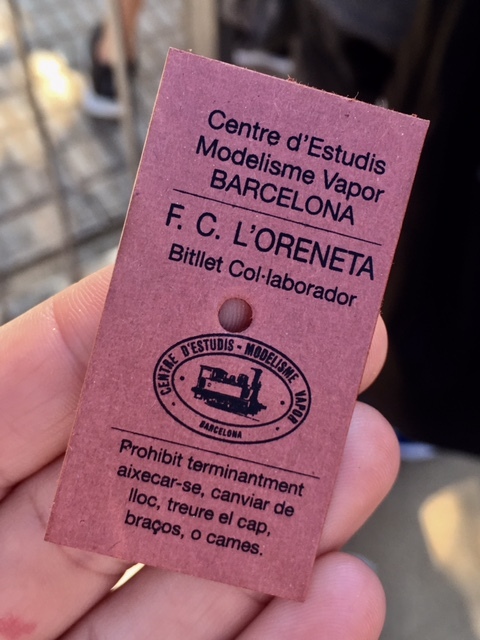 Our first Halloween in Barcelona was only two months after arriving here. So naturally, our heads were spinning. 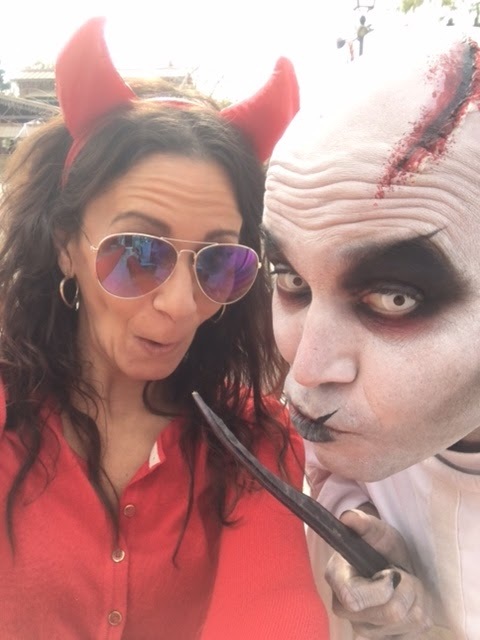 I was still trying to figure out where to find non-IKEA furniture and dryer sheets, let alone locate costumes, trick or treating events and pumpkins! We settled on pale orange flat gourds, last minute over-priced costume purchases and threw together a small class party with some friends at a nearby playground. Was it the American Halloween we were so accustomed to? Course not! 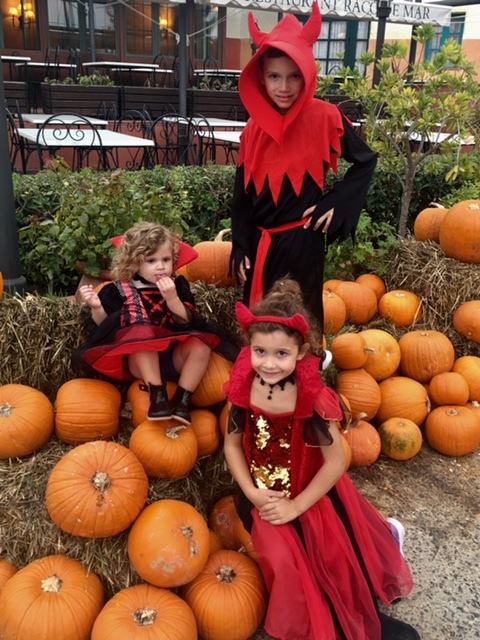 But it served its purpose, the kids were happy…..and next year would be different, I hoped! Now that we’ve had an entire year to scope out, explore and research our new city it’s amazing to see that this American this holiday is slowwwwwly growing in Spanish popularity! The first signs of Halloween were paper banners and white cob webs hanging from several bakeries. 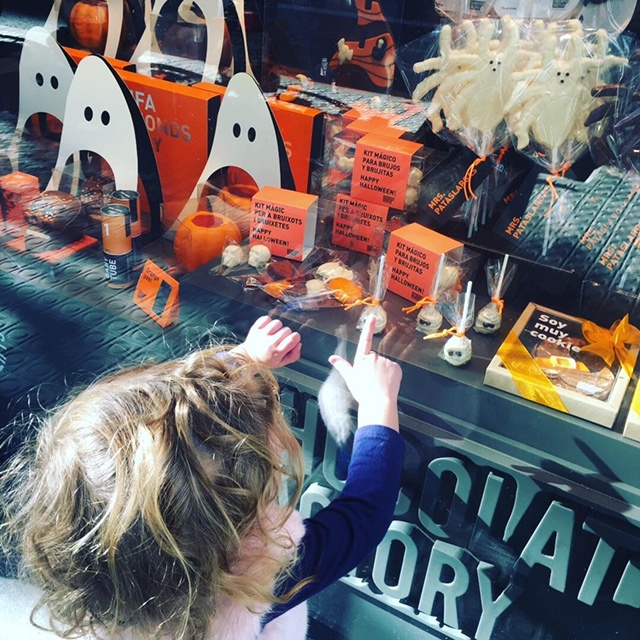 A nearby gourmet chocolate shop decked out their window display in orange and black. I got giddy with excitement the minute I spotted these first signs of the season! One afternoon, while playing at Parc de l’Oreneta, we overheard the Michael Jackson Thriller song coming from the woods?! And soon stumbled upon a haunted train ride where miniature steam engine trains were offering spooky rides to families. What a nice surprise this was! 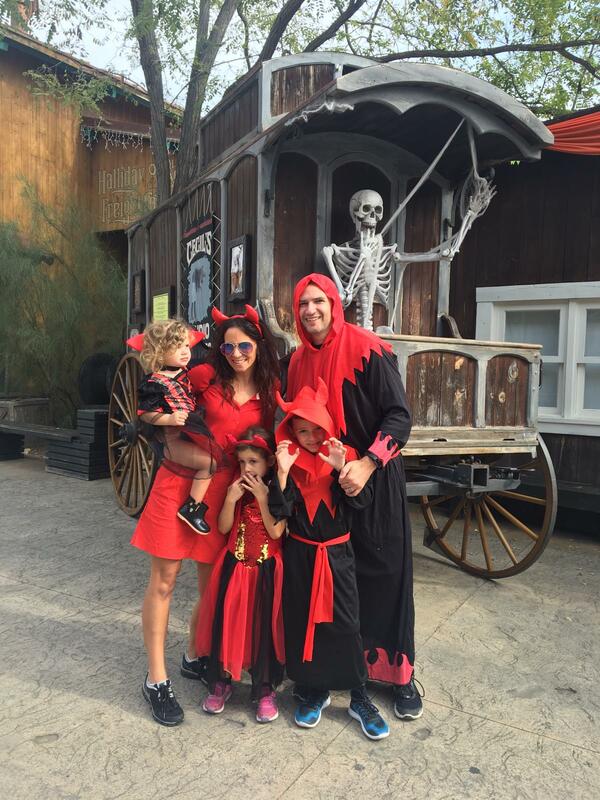 To our complete surprise, this place was Halloween on STEROIDS!!!!! 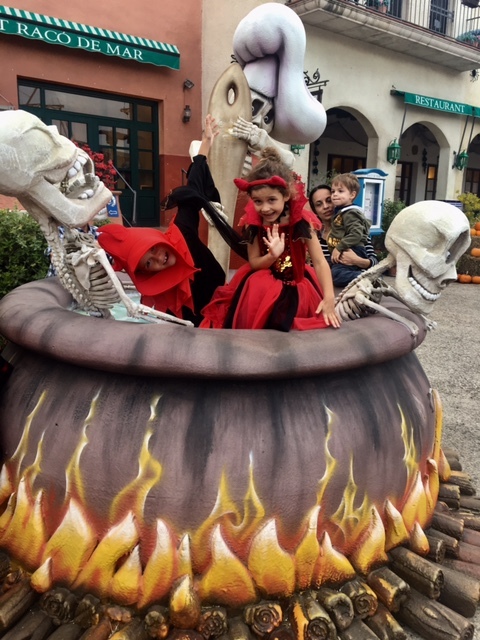 It blew my mind – the decorations, music, costumes, face painting, shows, theatrics, horror. My senses were in overdrive and that familiar feeling I remember from Halloween at home came flooding back. To top our favorite holiday off, a friend at school passed a flyer along to me (knowing all too well about my Halloween hysteria) with trick or treating at a nearby park. I figured, “Oh cute – probably four or five nearby stores will be giving out little candies.” Once again, I underestimated this incredible city’s ability to embrace an American tradition. The event easily drew in 600 children and their families! Streets swarmed with excited costume-clad trick or treaters. Store merchants donned their doorways dressed in disguise handing out goodies. This night was the “candycorn on the cake”, so to speak! It all gave me such a rewarding feeling….to know that our lives in a foreign city, as much as they have changed, can still enjoy the same beloved joys of a holiday from home. But as I said earlier, this is SPAIN! It all its grandiose beauty and rich culture, what would our lives be like here if we didn’t learn about and love local traditions? 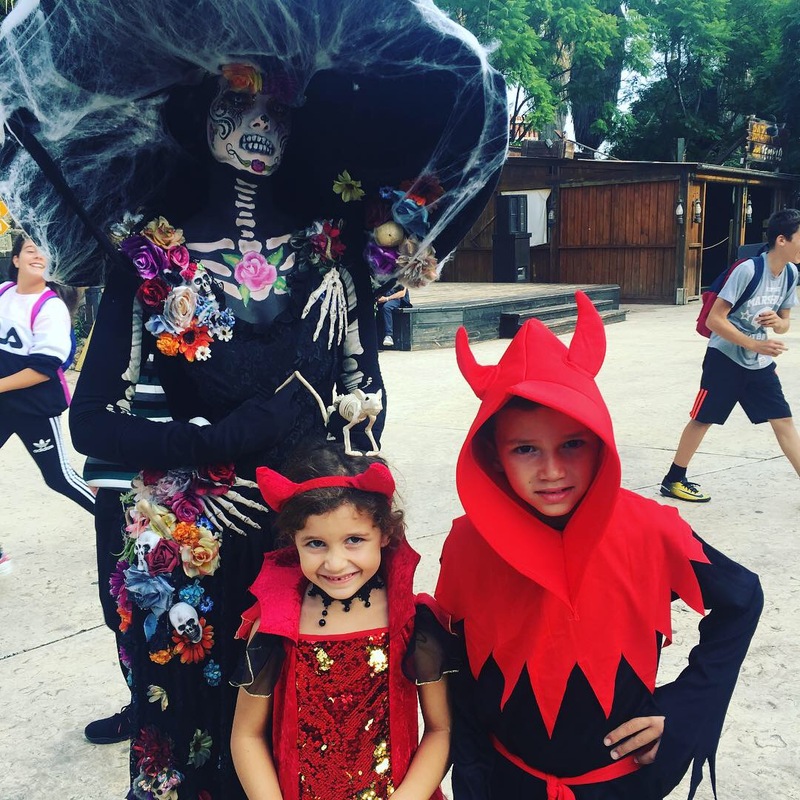 For one, many of the Halloween costumes we saw this year resembled Dia de Los Muertos – with the most beautiful, intricate face makeup and flowered costumes I’ve ever seen! This is a celebration on November 1 in Spain, South America and Mexico when the dead are honored. Families visit the grave sights of their loved ones and leave flowers. And with ANY holiday, comes special foods! We have simply fallen in love with the scents of roasted castanyas (chestnuts) and sweet potatoes prepared by corner street vendors. 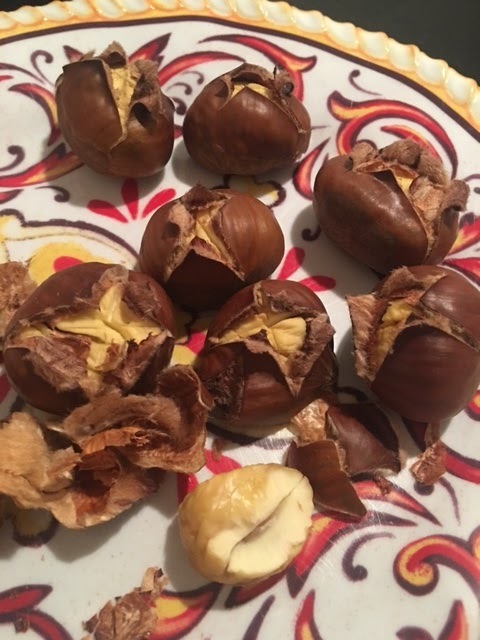 Now on an Autumn morning in Barca, my husband can be found standing at the oven carefully roasting castanyas to nibble on with his coffee. Sugary panellets paired with sweet Moscato wine is a delicacy prepared only this time of year with marzipan, cinnamon, potato and pine nuts. 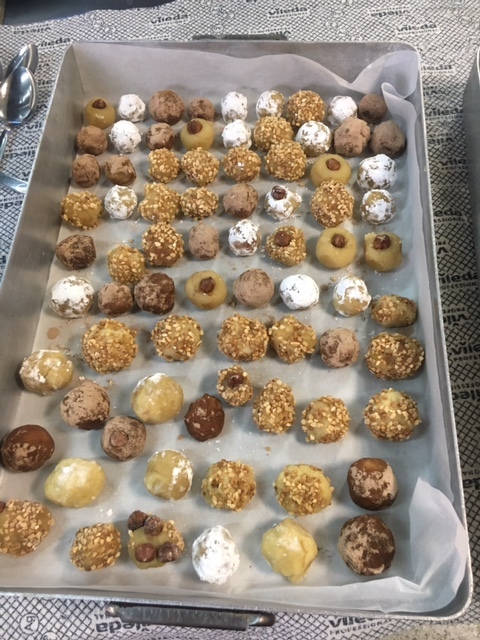 When my children came home from school with freshly prepared panellets from cooking class, I could barely steal a bite before they disappeared! And so, the Autumn season of Spain is upon us. 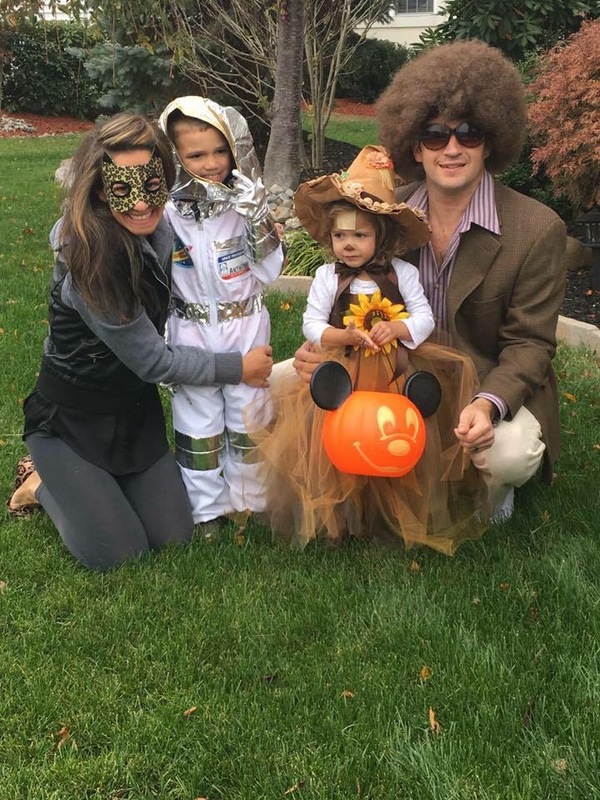 I like to think our American family dominated Halloween this year, so much so that I have a bit of a Halloween hangover! I trust in years ahead, when our life in Barelona is only a chapter of memories, Tony and I will sit down over a plate of hot castanayas and reflect on these special times….blending the old with the new.